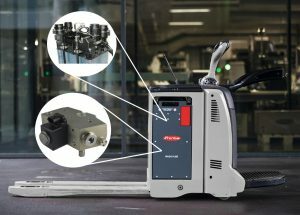 The picture shows a material handling fork lifter with the integrated HyLOG Fleet (PEMFC) of Fronius. In the upper circle the Media Supply Unit (MSU) of Elring KLinger is shown, in the lower circle the tank valve from OMB Saleri. The project aims at the development of a design of a flexible, scalable, high quality production line (process steps) for the manufacturing of PEMFC’s (Proton Exchange Membrane Fuel Cells). • The design of a flexible production process that allows a scale-up to 50.000 parts per year. • The definition of automatic quality control strategies and processes to ensure quality on high-volume production, including the organization of necessary re-work. • The development of flexible assembly stations that allow a gradual transition from manual operation to fully automatic processes. • Data collection, documentation and tracking methods that fulfill traceability requirements. The design that will be considered in the project include the manufacturing of parts of smaller quantity as well as very large quantities of PEMFC’s. Union’s Horizon 2020 research and innovation programme and Hydrogen Europe and N.ERGHY.